This article misses the big issue. Long lines are the least of the problems caused by HAVA. Most of the voting machines in use in America are easily hackable, and there is a mountain of evidence that they have indeed been hacked, affecting the outcome of key elections in the past. The hackers are not Russians but insiders, Democratic and Republican, but the altered outcomes overwhelmingly favor the Right over the Left, Republicans over Democrats. Given the myriad tactics of voter suppression (any mention of which is absent from this article), why would anyone concerned with honest elections have a “favorable opinion of the voting process”? 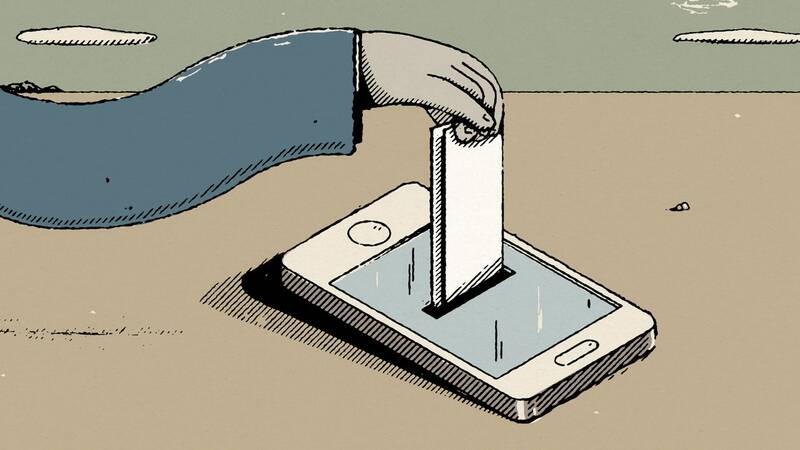 Why not use paper ballots and a pencil like so many other countries do? You do NOT need machines to count the votes as there are not quicker then the old method, not as accurate as the old method, not as secure as the old method and not as cheap as the old method. The only reason machine counts introduced was because they create another means wherein Taxpayer dollars can flow to the pockets of those that manufacture them and they create an easy way to hack an election so as to get the desired outcome. Exactly, Mr. Hoffman needs to get out more. I agree, paper is the way to go, with intense oversight in the counting rooms. The long lines aren’t from voting machines, it’s because so many polling places have been closed down to create those lines and discourage people from voting at all. This has happened everywhere in the US, but it’s even more prevalent in areas with people of color. Canada still does a paper count by hand. Results come in the day of the election. The fact that nothing will be done to replace our rigged voting equipment and procedures before the 2020 elections says a lot. No, the system does not need to be “updated” exactly. It needs to be replaced. US black ops has a long and partially known record of manipulation of elections and ballots in various ways across the world. It makes no sense to imagine that it would not use digital means towards these same ends. It makes even less sense to imagine that it would spend time and trouble to worry about foreign elections, then neglect its own. The US needs all paper ballots, counted and tabulated by hand in public with verification by all factions. Screw the machines. We citizens need to demand paper ballots. Who cares if it takes longer to tally and report the votes so long as we can have faith in the results. Until that happens, democracy is dead in America and revolution ever closer on the horizon. Don’t people understand that we’re typing on the best voting machines there could be? If you want a paper ballot when voting online, you could print a copy of your ballot. Gimme some paper please. Geez, even Wired magazine says this is the way to go! A lot can be said about it, but a lot of questions will remain. From where I am, not much is certain. Some range of people working with or around government, at the very least, can and sometimes do walk in and out of our accounts with the greatest of ease. Hardware is backdoored, routine encryption is backdoored, any online transmission is apt to scatter itself through dozens of servers, from any one which it can be taken. Most if not all social media sites, free email services, and businesses provide information to the government. Which information? All of it that they have, apparently. At least as of right now, it appears that the people who have this access are at least not mostly in the business of emptying people’s bank accounts. As nearly as I can tell, they do not do so because it would cost them other sorts of business or other political influence. But I have to infer all this from very incomplete information, so you can imagine that I do so with a good bit of trepidation. Now, at what point does that cease or change? That I do not know at all. These agencies are largely populated by people who are in a broad sense double-agents–that is, they are “assets” who work for an agency by virtue of working in some other organization as well, and thereby have multiple loyalties. Walking away from an organization with data represents a very considerable risk to individuals, so not everyone does it. On the other hand, someone recently skipped with some fifty terabytes of data. It’s just hard to know what will actually happen.